Jeff Poole stands beneath the tower that will broadcast the signal of Sandpoint community radio station KRFY-FM later this summer. 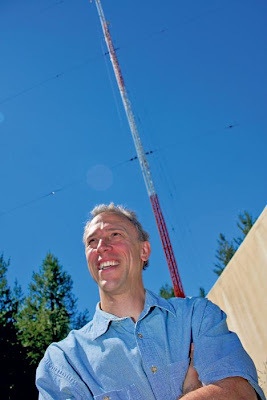 (Photo by DAVID GUNTER) (This is the first in a series of two articles about low-power FM stations that have been licensed by the Federal Communications Commission to serve Bonner County.) SANDPOINT — A common gripe about radio is that talk show hosts — be they from the left or the right — tend to dominate the public discourse as they prattle on daily about their personal agendas and myopic worldviews. Musicians, too, bemoan the fact that radio represents an unbreachable fortress when it comes to getting their songs heard by a wider audience. Starting this summer, the game will change in dramatic fashion for radio listeners around Bonner County, as a pair of community radio stations prepares to hit the airwaves with a full slate of locally produced live music, talk and public affairs programming. Turning the dial The two stations, which will operate as low-power FM broadcasters, will cast a radio net that could garner a core audience that includes residents of Sandpoint, Sagle, Ponderay, Kootenai, Hope and Clark Fork. Some listeners will also be able to pick up their signals from as far away as Athol and Bonners Ferry, depending on location. KRFY plans to start broadcasting this summer with 1,200 watts at 88.5 on the FM dial. KZRP-FM is scheduled to go on the air about a year later, showing up at 90.7 with a signal of 400 watts. The local stations have used entirely different approaches to jumping through Federal Communications Commission hoops in order to gain approval for their licenses and also bear little resemblance to one another as far as studio settings and broadcast gear. What they do share is a belief that the airwaves should act as an open forum for local residents. Community radio, they explain, can level the playing field when it comes to free expression of ideas, sharing stories and letting a wider variety of music get played on-air. Finding a voice The studio is still being wired and final interior construction being buttoned up, but Jeff Poole already has a firm idea of what Sandpoint station KRFY will sound and look like a month or two from now. The mission for Sandpoint Community Radio states that: “SCR is committed to lowering barriers to public access of local airwaves.” Poole offered another word to describe the station's overarching goal — sustainability. “It's a vague concept on one level, but it has a connotation of, 'This is something I will not overuse or abuse; you have to give back what you take,'” he said. “There are a lot of people here in town that strive for sustainability and act on it. If those people want to have a voice, Sandpoint Community Radio is ready to offer it.” According to Poole, KRFY will broadcast “three-quarters music and one-quarter public affairs,” with 75 percent of the programming originating locally. In many ways, the day's schedule could closely resemble the Golden Age of rural radio, with gardening shows hosted by Master Gardeners, cooking programs that offer recipes and kitchen tips and singer/songwriters stepping up to the microphone to share their tunes in real time. “We're also planning to link to the schools so that kids can create content for themselves, Poole said. During the same period that Sandpoint volunteers were raising money and sharing the responsibilities of licensing and studio preparation, a Hope man was walking that path alone. For the past two years, Bruce Bishop has handled his own FCC paperwork and cobbled together equipment for what he called “pennies on the dollar.” His broadcast gear could rightly be described as old school, but his vision for community radio is in the vanguard of what small town FM programming could look like for years to come. In Sunday's Bee: How the Internet is causing headaches for big broadcasters while breathing new life into low-power stations, building a radio station on a shoestring budget and what to expect when community radio goes live in Bonner County.